I usually rely on our local farmers market for tomato plants. 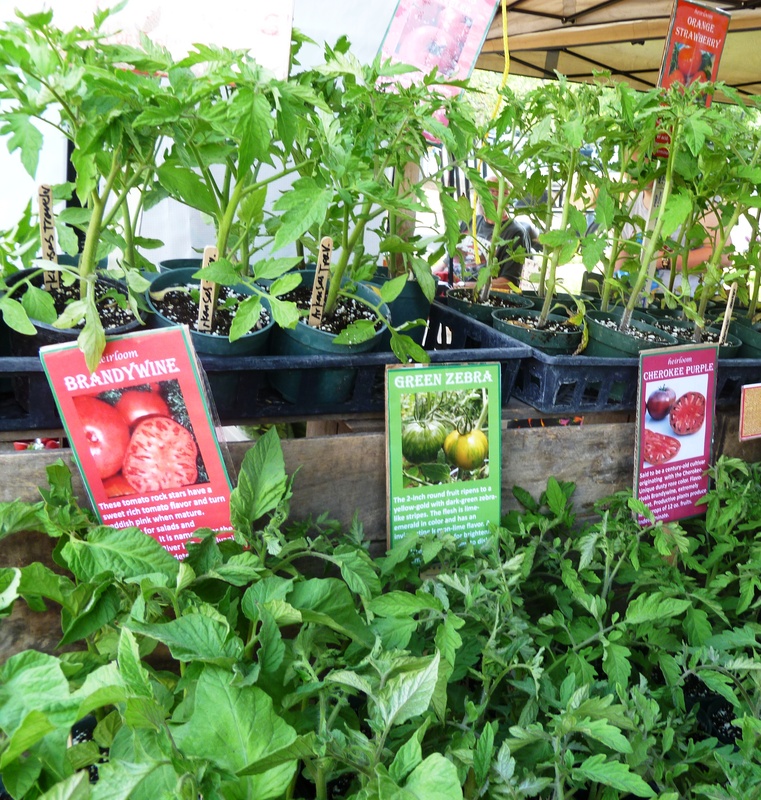 Vendors from Pennsylvania and the Shenandoah Valley offer scores of varietals, from hardy hybrids like Big Boy to heirlooms like German Johnson. Then Greenstreet Gardens came to my neighborhood with a selection of the 175 (!) tomatoes grown on 55 acres in Anne Arundel County, Maryland. I felt like a kid in a candy store. So many choices, and just a little slice of community garden plot to plant.Our first year, CRR and I planted 13 different tomato varietals -– our friends and colleagues were deliriously happy with our excess but we vowed never again to over-plant. Now we’re at a manageable nine. But which nine? We chose two Brandywines, as sturdy as the Pennsylvania Amish credited with its creation in the late 1800s. One is a traditional Brandywine; the other is Sudduth’s, a varietal traced to a Tennessee tomato lover. Then there’s the Old German (no, not a nickname for CRR), a Mennonite heirloom, yellow with red streaks, that produces fruit that range from one to two pounds. Each. Another heirloom draws rapturous descriptions that would befit a fine Cabernet: rich, complex, almost smoky. That’s the Carbon, a nearly black tomato. For color contrast, we’ve got Orange Blossom, which is a baseball-sized orange globe. Violet Jasper is red with purple and green streaks. Juliet, a cherry tomato, will be the first to ripen. I can safely predict we will gobble down the first Juliets right there in the garden bed. It produces bright red fruit on grape-like clusters. Sixty days to tomato bliss, followed by several months of tomato nirvana, thanks to the fruit traced to the Peruvian desert and spread round the world by the Spanish explorer Hernan Cortez. Good for you – what a great resource you have available to you! I grow my own seedlings to get that sort of variety but I’d love having the ability to buy them ready-to-plant! (I gave up on tomato cages years ago – I use stakes and gently “truss” them up as they grow and sprawl.) Hope you have a great garden this year!